Schumpeter stated almost 100yrs ago that economic measures of our society's trade and exchanges, and therefore modern markets, where static and two dimensional snap shots of a moving, multidimensional and dynamic concepts. The argument for prohibition has been long and ongoing, yet the clear economic reality that this approach to managing this social issue, which is as old as time, is making it worse! methamphedamine only exists as the result of the war on drugs and there are people throughout the professional world and community whom can vouch for that.. Then again, in terms of harm influence and negative outcomes so is alcohol... Have we got to the point where our societies encourage and promote the disempowerment of us? Why when we can all have a voice, do we continue to let the decision makers create the most broad risk of harm for those whom are furtherer away from the decision making?? 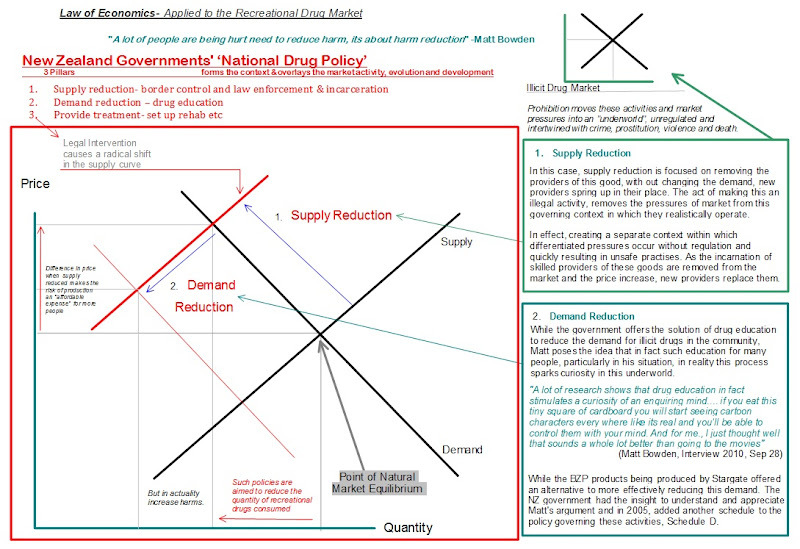 Below is a exert from a Case Study on Matt Bowden & Stargate International, it explains in economic market terms, how the progression and development of the recreational drug market is made worse by prohibition, or antagonised by the "war on drugs"..